FLEX XFE7-15 Long Throw Orbital Starter Kit Choose Your Pads! Home > Shop By Brand > FLEX Polishers FREE SHIPPING! > FLEX XFE7-15 Long Stroke Orbital Polisher Free Bonus! > FLEX XFE7-15 Long Throw Orbital Starter Kit – Choose Your Pads! FREE SHIPPING! 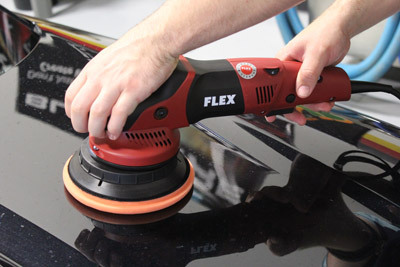 Start your FLEX XFE7-15 polishing experience the right way! FLEX XFE4-15 Long Throw Orbital Starter Kit combines the powerful FLEX XFE7-15 Long Throw Orbital Polisher with the 6.5 inch Lake Country Thin Pro Pads, for a polishing match made in heaven. Lake Country Thin Pro Pads are designed specifically to work with long throw polishing machines, and holds up to whatever polishing task you may have. Whether you’re adding the FLEX XFE7-15 Polisher to collection, or starting fresh, the FLEX XFE7-15 Long Throw Orbital Starter Kit sets you up with everything you need to get started. The FLEX XFE7-15 Long Stroke Orbital Polisher has a rounded head for a steady grip while in use. While manufacturing the FLEX XFE7-15 Long Stroke Orbital Polisher, FLEX wanted to keep some of the familiarity that we’ve come to know and love. The overall design of the handle and body is very similar to the FLEX XC3401, but actually feels slimmer and easier to use on the FLEX XFE7-15. Rather than the standard bale handle used on other long throw polishers, the FLEX XFE7-15 features a round head, for a more firm and less strenuous grip. 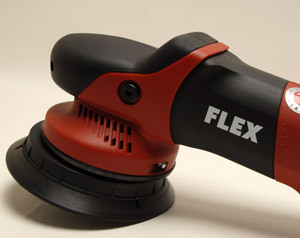 The FLEX XFE7-15 Long Stroke Orbital Polisher is a free spinning model, meaning that there is no forced rotation like its older brother, the XC3401. This allowed FLEX to give the machine a longer 15 mm throw, to cover more area, faster. FLEX is already known for their high powered machines, and the XFE7-15 is a testament to this. 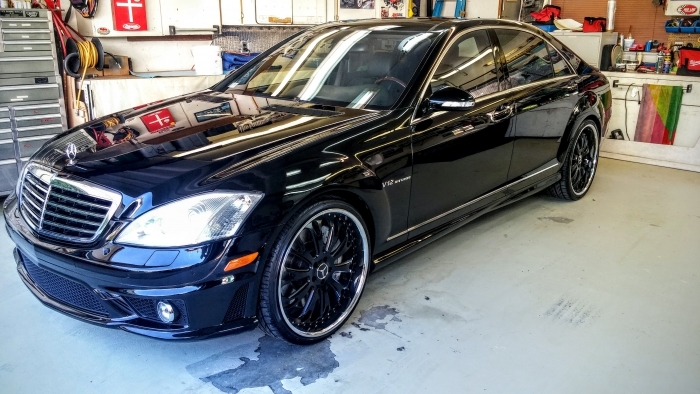 The 6-speed motor reaches a max rate of 9,000, giving you all the bang you’ll need for a detail. Use the FLEX XFE7-15 Long Stroke Orbital Polisher with Lake Country 6.5 inch Thin Pro Pads for the best paint polishing system. Weighing in at only approximately 5 lbs, the FLEX XFE7-15 is lightweight enough to use for extended periods of time, and still get the correct power you want. Perfect for everyone from novices to professionals checking out what the “long throw” world has to offer, the FLEX XFE7-15 is the perfect addition to your detailing line-up. FLEX XFE7-15 Long Throw Orbital Starter Kit includes everything listed below, plus you choose 5 of the following 6.5 inch Lake Country Thin Pro Pads to complete your kit! This pad has an open cell that can dissipate heat well and stays pretty firm even with heat from the polishing process. Use it for spot repair or heavy compounding. The white pad features very dense foam. Use this pad to remove light imperfections, apply a light polish, cleaner wax, and any jobs for which you'd use the standard Lake Country white polishing pad. This soft, imported foam is ideal for applying the final coat of wax or sealant. 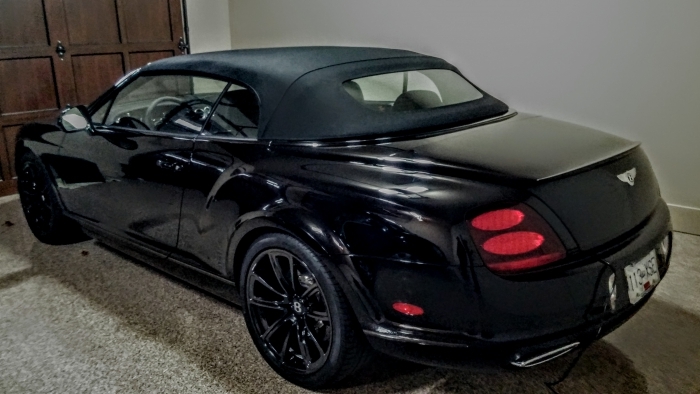 The foam works especially well when applying liquid waxes or sealants because it is firm enough to keep the majority of the product on the paint, rather than soaking it up. A total retail value of $528.91. You save $58.92! I like it i does good correction with menzera fg400 and slim pads orange and gray to start with the white on a black ford ascape . i did go back to flex Rotory for faster corection and then the new flex large throw . i think the longer handle would give it more control a little short for this type of machine i have 3 flex machines now . ProsGreat power at high speed less wear and tear on the body . ConsSmaller backing plate for pads. I was fortunate enough to be part of the team at Detail Fest for the filming of Competition Ready. We all used the new FLEX XFE buffer and OMG it was a dream. The machine is sooooooooooo smooth and soooooooooooo powerful, plus Lake Country thinpro pads are the bomb on this tool. I saw this kit after the show and it was a no brainer to pick it up. ProsSmooth and powerful Flex build quality! ConsWish smaller backing plates were available, but I heard they're coming soon!